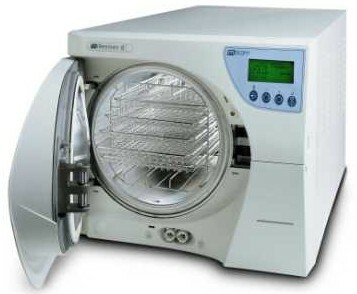 Steam sterilizers are sometimes referred to as steam autoclaves, or simply autoclaves. Steam sterilization destroys microorganisms and spores faster than any other method. It consists of a pressurized chamber that elevates and holds a high temperature. Steam kills microorganisms by coagulating and denaturing the cell protein. Now you might be asking, “Should I use a steam sterilizer?” Due to the high temperatures required, it may only be used with heat and moisture stable instruments, equipment, and devices. So, what are the alternatives? If you can’t use steam sterilization due to heat sensitive or moisture sensitive equipment, gas sterilization could be a good option. Most gas sterilizers us ethylene oxide, a colorless gas that destroys microorganisms via a process called alkylation. Ethylene oxide reacts with material inside the cell membrane to kill microorganisms. There are some disadvantages to gas sterilization, including long sterilization time. However, if you have equipment that is both heat and moisture sensitive, it might be the best option for you. If your equipment is able to tolerate moisture, a dry heat sterilizer might be a good option for you. Because dry heat sterilizers can be used to sterilize sharp instruments, many dental sterilizers use dry heat. Sterilization is accomplished via oxidation, which coagulates cell protein. Like gas sterilization, dry heat sterilization takes longer than steam sterilization. Before using dry heat sterilization, make sure your equipment can handle temperatures up to 340 degrees celsius. When is steam sterilization NOT the right choice? Moisture can corrode some metals. High heat can melt or distort acrylics, styrene, and PVC. Moisture can adversely affect electronics. Steam sterilizers can cloud or leave water mark stains on some materials. The efficacy of any sterilization process will depend on the nature of the equipment and the extent of contamination. No matter what, the most important thing is to validate the method you decide to use. This must be done for every type of equipment. If you don’t validate the process, you don’t really know if the equipment is sterile. You could also cause damage to sensitive instruments. Check on a weekly or monthly basis to make sure your sterilizer is still working properly. For details about the validation process, see our previous article, How Do I Know My Sterilizer or Autoclave Works? Hopefully we have helped you answer the question, “should I use a steam sterilizer?” If you still aren’t sure, we are here to help you. Call one of our sterilizer equipment experts at 877-789-9983 to discuss your specific situation. We can provide you with free information about the best sterilization manufacturers and equipment that will help you make the best decision.